for you and your staff. 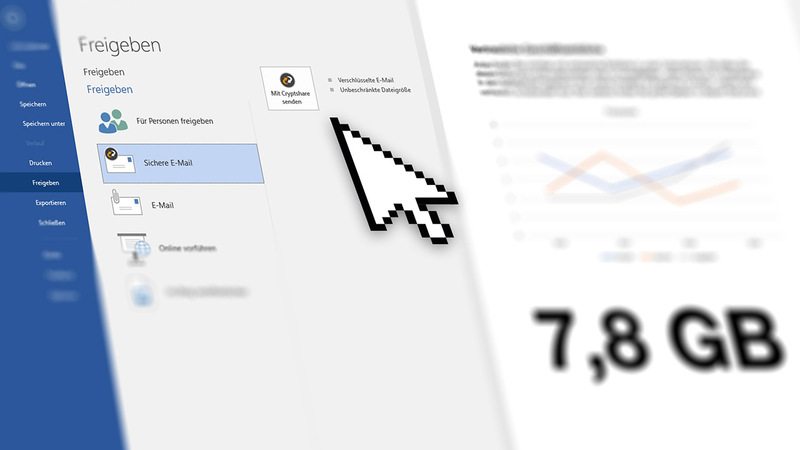 With Cryptshare protective e-mail classification. Due to increasing requirements in data protection and data security, companies have to manage their data processing processes securely. 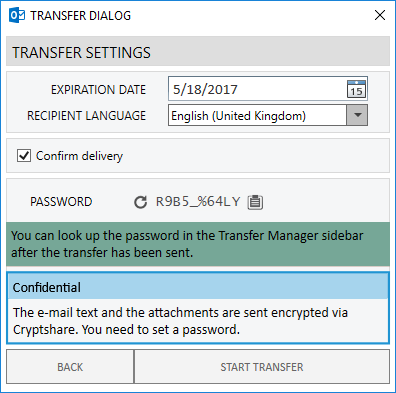 In addition to e-mail encryption, Cryptshare offers the capability to classify data before transmission with Microsoft Outlook. Data classification is an important compliance standard asked for by the GDPR. 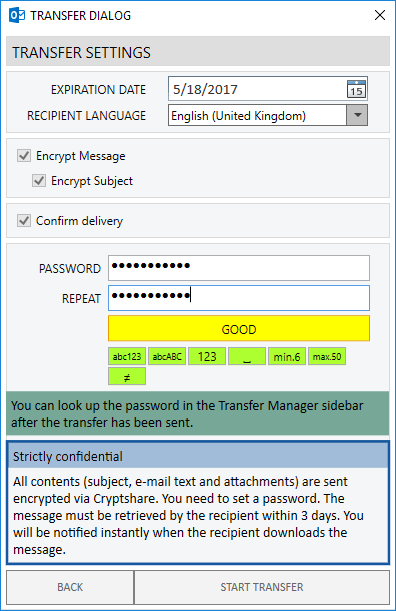 Cryptshare protective e-mail classification makes it possible to classify outgoing messages depending on the sensitivity of the contents in different protection classes as defined by the enterprise. Depending on the selected protection class, customised transmission paths and settings can be specified administratively. The sender uses Microsoft Outlook as usual. 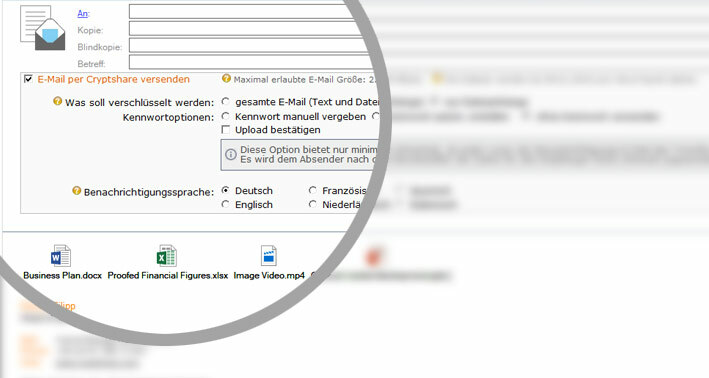 If the protective e-mail classification function is activated, the "E-mail classification" button appears next to the "Send with Cryptshare" button. By clicking on the button, the customizable protection classes available in the company are displayed. If the user moves his mouse over one of the protection classes, a so-called ‘tooltip’ appears, which provides further information on the meaning of the protection class. This helps to train users in security requirements as demanded by the GDPR. The protective e-mail classification is set up by the administrator according to their legal needs and the company's legal requirements. They can release the user from defining a protection class or make it binding. If the specification of a data class is mandatory, the user must select an option before they can send the message. 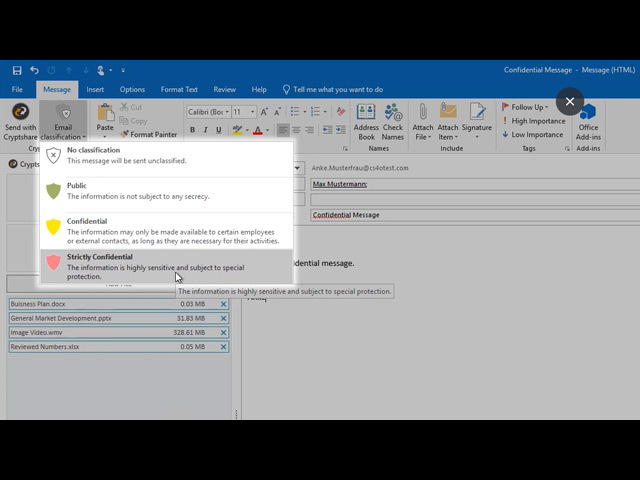 Only if the selection allows no classification can the user send messages with the protection class "No classification". the sender decides for himself whether it should be sent with Cryptshare or not. If the settings made by the sender conflict with the settings of the selected protection class, they receive a message and can adjust the settings. This way the company ensures compliance guidelines are kept. 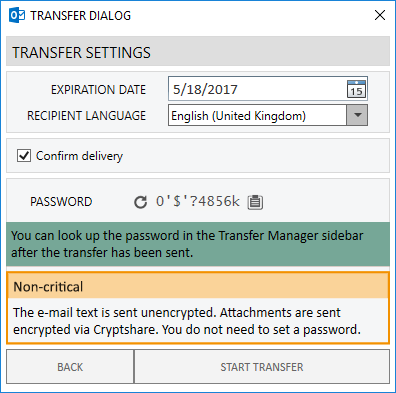 If the dispatch is carried out with Cryptshare, certain transfer options are preset according to selected protection classes. Depending on the selection, they can be editable, greyed out or invisible. The sender can easily recognise the classification of his own messages as each protection class has a clear colour coding. In the "Sent Items" folder and in the upload manager, he can see under which protection class his message was sent. 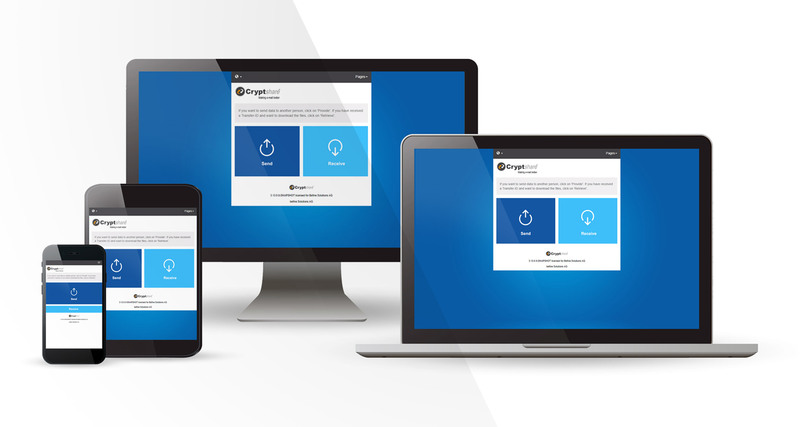 The administrator can create the classification rules in the Configurator. They have the possibility to create an example configuration with default values, which can then be changed according to the specifications. This is faster than editing a new empty file. The example configuration includes three classifications for non-critical, confidential, and strictly confidential content.